Selarang Camp Changi, Johore Bahru, Adam Park, Selarang Barracks Changi. Tarsau, Kanu II, KanuI, Tarsau, Tamarkan, Chungkai, Nakom Chassi, Chumphon, Petchaburi, Kachu Mountain Camp. Thailand‐Singapore by aircraft, Singapore‐Fremantle, HMT Highland Brigade. Legally adopted by Charles Edward Smith. This soldier was shell shocked at Ulu Pandan on 12/2/1942. Evacuated to St. Joseph’s Hospital on 13/2/1942. 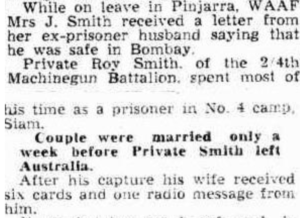 Discharged to unit on 20/2/1942. View Peter Winstanley’s video interview of Roy Smith WX13552. 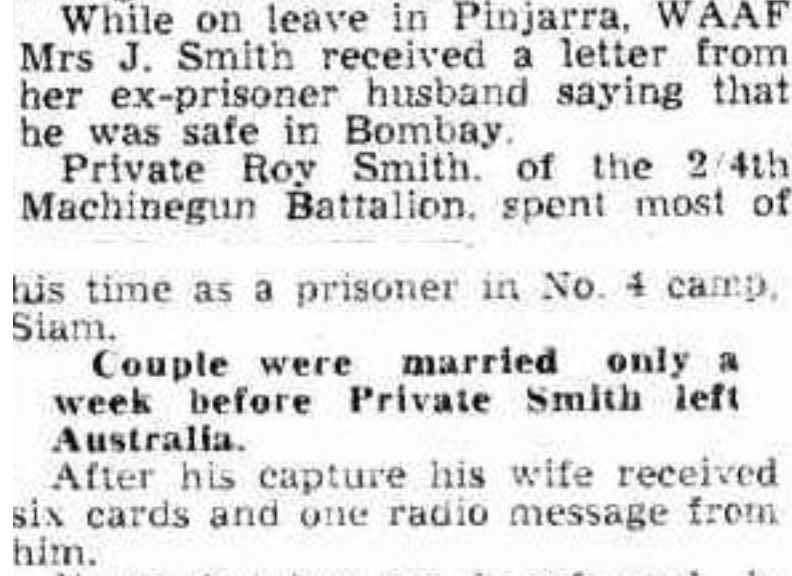 The above was included Daily News 12 Sep 1945 – there were messages and very short stories of other soldiers who had survived the war. Roy Smith died 25 June 2009.